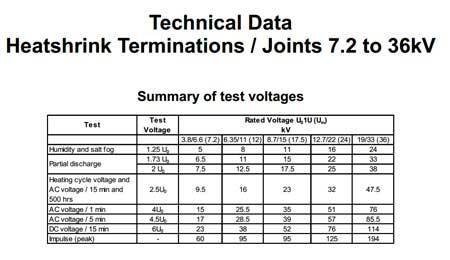 T&D are Main Distributors for Shrink Polymer Systems (SPS) high voltage (HV) heat shrink cable joints, cable terminations and busbar tape and tubings for 6.6kV, 11kV, 24kV and 33kV. SPS HV Cable Joints - Straight, transition, pot-end, trifurcating and branch cable joints for both polymeric and paper cables, 11kV-33kV. SPS HV Cable Terminations - Single and 3 core, indoor and outdoor high voltage cable terminations for both polymeric and paper cables, 11kV-33kV. SPS 6.6kV, 11kV and 33kV heat shrink cable joint kits and cable termination kits are quick and easy to install by trained HV jointers providing high reliability and excellent performance for high voltage cable circuits. SPS heat shrink cable termination and joint kits are suitable for three and single core XLPE, EPR and PILC cables, including utility specification Triplex cables 11kV-33kV. Jointer Friendly - no cable jointer retraining required, cable preparation and cable termination or joint installation is in accordance with standard heat shrink practice. Economical - significant cost savings over other HV heat shrink cable termination and joint kits, contact T&D to discuss your next requirement. Peace of Mind - SPS HV cable termination and joint kits (11kV-33kV) are installed in the building services, oil, gas and petrochem, heavy industry, rail, power generation and offshore industries including MoD, Network Rail, British Airports Authority and National Grid sites. Thousands of SPS HV cable joints and terminations are in service throughout the UK and global electrical power industry.